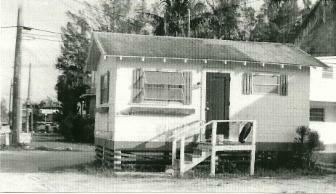 The first free public library on Fort Myers Beach was located in this small cottage owned by Clem and Lucy McGee. The library was manned a few hours each day by volunteers and remained in this cottage from 1955-1956. In 1957, the library moved to a larger cottage on Avenue A with 3,000 books in its collection. In 1961, a new library was built on Oak Street. In 1978, the library was expanded to make room an increasing circulation and more parking. A two story structure opened in 1994 facing Estero Blvd rather than Oak Street. Finally, the new, state of the art library was opened in 2012. As a kid, I can remember spending many hours in the library on Oak Street. At that time, we did not have air conditioning in the school or in our home, so the library was a great place to cool down on hot summer days.